bbc.comEngland must show "heart" and "fight" in the second and final Test against Pakistan at Headingley, according to fast bowler James Anderson. Joe Root's side were beaten by nine wickets at Lord's and have to win in Leeds to avoid a series defeat. "It's going to take some special individual performances this week," said Anderson. England have called up Surrey left-arm seamer Sam Curran as cover for Ben Stokes, who has a tight left hamstring.Stokes may be passed fit after an assessment in training on Thursday but losing him would be a blow as England search for form. "It's quite easy for the confidence of the team to take a hit when you have a defeat like that," added Anderson. "So we'll try, as well as using our skill, to use our heart, to use the fight we have in the dressing room to show people what we can do. "You suffer a few defeats and you need something special to turn it around. That's all we can focus on." After a winter where they failed to taste victory in Australia or New Zealand, England have now gone eight matches without a win. In the aftermath of the defeat at Lord's, coach Trevor Bayliss said his team would be a "little embarrassed" by their performance. When asked if his message was getting through to the players, the Australian added: "Obviously not enough. You almost throw your hands up sometimes." Anderson said: "I'm not sure what he means. We're talking a lot, trying to figure out what's going wrong. "As players, all we can do is try and deliver out on the field and we've not been doing that as a team. "Trevor can't come out there with us and tell us how to bowl. It's up to us to take that responsibility on our shoulders. " In addition to Bayliss' comments, former England captain Michael Vaughan has suggested the team would benefit from a "shake-up", potentially to the extent of leaving out Anderson's new-ball partner Stuart Broad. Anderson, though, does not believe that England need to have their "feathers ruffled". 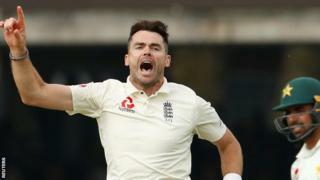 "When you suffer a heavy defeat, there's always a lot of noise around that," said Anderson, England's all-time leading wicket-taker. "Lots more opinions come out. This has to be done; that has to be done. There's not a lot that players can do about that. "The outside noise is always there and it's a bit louder when you perform badly. That's something you've just got to deal with as a sportsman and block out as best you can." » England v Pakistan: Who has made a case for a place in England's Test squad?